When I moved to Chicago, I did not know many people in the developer community. But after living here over a year and working here for over 2 years, I've discovered that the metropolitan Chicago area boasts a strong developer community, led by a number of dedicated influencers. I was impressed by the number of meetups, code camps, and other events that are run by volunteers. On October 19, Microsoft invited influencers from Chicago and its surrounding areas to come to our office for a Chicago Influencers Summit. We invited leaders of key user groups from around Chicagoland, as well as influencers who frequently lead community events. Not all the influencers were from the .NET community, as we invited leaders from Java User groups, the node.js meetup, Ruby developers, and many others who have very little interest in Microsoft technology but who still volunteer their time supporting the local developer community. 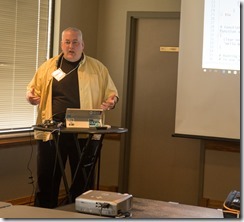 18 influencers attended, as well as Microsoft Technical Evangelists Sarah Sexton and me. We began by giving everyone a chance to introduce themselves, followed by an introduction Microsoft DX and its goals within the community. We had an excellent discussion about how we can better communicate with one another and debated the value of regular phone calls, threaded discussions with tools like Yammer and Slack; and a community calendar. We decided on creating a Wordpress site with a calendar and a comment section. We also decided to reboot the monthly "Midwest Geeks Call" - a once-popular Skype call that has not been well-attended in recent months. We settled on a more convenient day and time for this call. An open discussion on issues faced by event organizers yielded some interesting conversation topics, including an exchange of ideas on the importance of diversity among conference speakers and how to increase diversity. We also discussed the possibility of hosting a community event in early 2016, but did not finalize plans for this before adjourning for the day. The biggest benefit we gained from this event was an opening of communication channels - not only between Microsoft and the community; but also between supporters of disparate areas of the developer community. I believe this will be a good step in the direction of keeping these communication channels open. Hurricane Joaquin pounded the east coast much of the week and threatened to cause havoc with thunderstorms in Huntsville, AL, hundreds of miles from the ocean. Chris Gardner, organizer of the first DevSpace conference, crossed his fingers, glanced at the sky and hoped the weather would not deter attendees and speakers. Ultimately, the thunderstorms did strike Huntsville, but only in the evening and they were not enough to disrupt the first DevSpace conference. In its first year, the DevSpace conference in Huntsville, AL attracted about a hundred attendees. Although the attendees were mostly from within 200 miles of Huntsville, the speakers came from all over the US, including Ohio, Indiana, Illinois, Florida, Tennessee, Texas, and California. There were a surprising number of presentations on Application Lifecycle Management and quite a few talks on soft skills, such as Finding Leadership Opportunities, Public Speaking, and Improving Listening Skills. Alan Stevens of Knoxville, TN delivered an excellent keynote in which he talked about the inherent imperfections in production code and how we can continually improve that code base. I delivered 2 sessions: Own Your Own Career - Advice from a Veteran Consultant; and Microsoft Azure Without Microsoft. Huntsville, AL is also home of the University of Alabama - Huntsville and Chris arranged a student workshop for me at the university the day before the conference. I was able to teach students about cloud computing and Azure and get them to activate their Dreamspark Azure accounts and deploy a web app. DevSpace is one of several smaller conferences that have started or grown recently in response to the cancellation of DevLink in Nashville, TN. 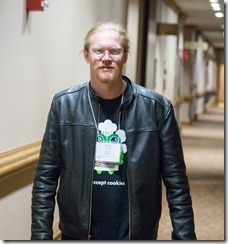 Conference organizer Chris Gardner announced plans for a 2016 edition of DevSpace. This was my first visit to Alabama and I really enjoyed it. The people were friendly, the area is beautiful, the conference was enjoyable, and Hun4tsville has a quaint, pleasant downtown area. My only regret is that I did not get a chance to visit the Space Museum. But that gives me a reason to return. In this screencast, you will learn 3 different ways to create an Azure Web App using the Azure Management Portal. In this screencast, we show how to create a new Virtual Machine in the Windows Azure portal. I recently spoke with Data Scientist Richard Conway from Elasta Games, who described how his company does analysis of online games. You can watch and listen to this interview below. In order to use Azure tables, blobs, and queues, you must first create an Azure storage account. In this article, I will walk you through the steps to create a new Azure Storage Account. Log into your Azure account and launch the portal (https://manage.windowsazure.com/). In the left menu, click the "STORAGE" icon (Fig 1). This will list any storage accounts you currently have for this subscription. To create a new Storage Account, click the [NEW] button (Fig 2) at the bottom left of the portal and select DATA SERVICES | STORAGE | QUICK CREATE from the popup menu (Fig 3). The QUICK CREATE dialog displays, as shown in Fig 4.
where accounttname is the name you assign to the storage account. The portal will let you know if you enter a name this is not allowed or that is already taken. At the REPLICATION field, select the type of replication you would like for your storage account. Click the [CREATE STORAGE ACCOUNT] button to create the new storage account with the settings you have entered. When finished, a confirmation message displays (Fig 5) and your storage account should be listed in the portal. You are now ready to use your storage account. Earlier today, Microsoft held an event in New York city to talk about devices that support Windows 10. Most of these devices (Surface Pro 4, SurfaceBook, new Lumia phones, Microsoft Band v2) will be released in the next few weeks, while the Hololens will likely be out next year. Personally, I am most excited by the new phones (Continuum is amazing) and by the upcoming SurfaceBook (which I did not know about before today), but there was impressive news in every category. 12 hours battery life. Doesn't burn battery while closed. Today I am grateful for time spent yesterday with friends at the MSU football game and dinner afterward in downtown East Lansing. Today I am grateful for 1500 Twitter followers. Today I am grateful for a chance to spend an afternoon with Bill Fink and his family yesterday. Today I am grateful for my first tech presentation at the University of Illinois and the premiere of a new talk last night. Today I am grateful for a chance to meet up with local MVPs last night. Today I am grateful the 3 cloud camps are successfully behind me. Today I am grateful for a good night sleep 3 nights i a row. Today I am grateful that I did not gain weight while traveling the last 3 weeks. Today I am grateful for dinner last night with Jason Fox. Today I am grateful for Texas barbecue. Today I am grateful to Eric, Michael, and Randy for helping make the first cloud camp a success yesterday. Today I am grateful for a chance to visit my mother this past weekend. Today I am grateful for John and Kim's wedding celebration yesterday. Today I am grateful for: -The MDOT worker who rescued me when my car died on the freeway yesterday. -Dinner & drinks with college friends last night. Today I am grateful for time with the DX team from all across the country this week. Today I am grateful for a chance to learn about Azure Machine Learning at yesterday's hackathon. Today I am grateful for a chance to visit yesterday with Steve for the first time in years. Today I am grateful for my first trip to Qualcomm Stadium in San Diego to watch the Chargers-Lions game yesterday. Today I am grateful my son stopped by to visit yesterday while I was in town working the hackathon. Today I am grateful for a full room last night for my first time speaking at the ACM Chicago chapter. Today I am grateful I was able to make it to Purdue yesterday in spite of a driving rain storm. Today I am grateful to spend time with WhatsThe BigIt yesterday for the first time in months. Today I am grateful for my first game at the current version of Busch Stadium last night. Earlier this week, I interviewed John Brengman of Radication Games. He and a group of students have created applications that teach about diseases and their treatments while playing games.